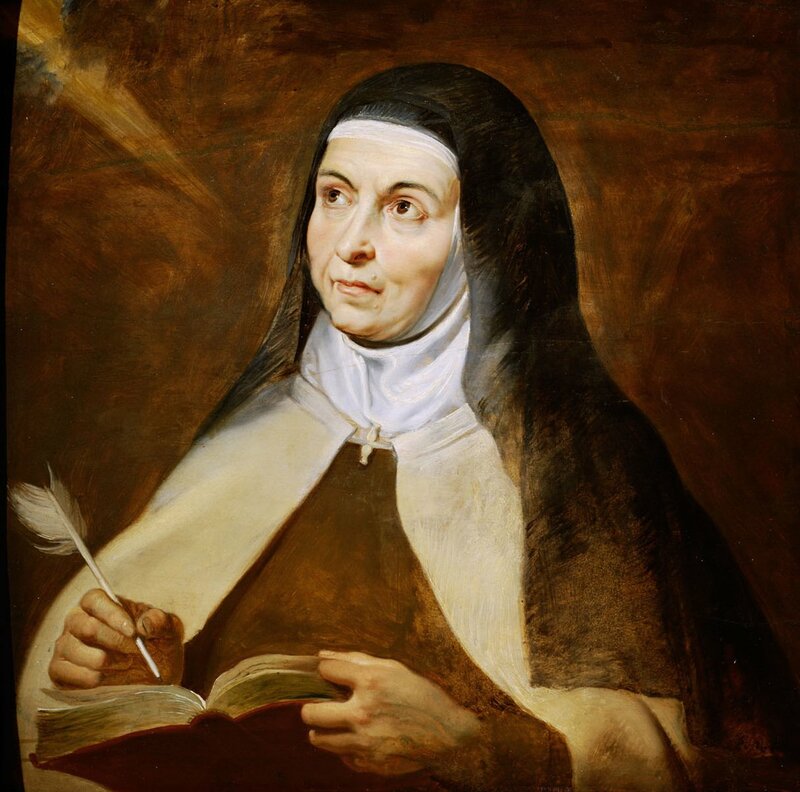 Saint Teresa of Ávila (1515-1582) was a Spanish mystic, Carmelite nun, and was canonized a Roman Catholic saint by Pope Gregory XV. In her penetrating autobiography, The Life of St. Teresa of Jesus, she describes many of her ecstatic visions of the Divine, which should ring many bells for Latter-day Saints. …I was one day in prayer when I found myself in a moment, without knowing how, plunged apparently into hell. I understood that it was our Lord’s will I should see the place which the devils kept in readiness for me, and which I had deserved by my sins. It was but a moment, but it seems to me impossible I should ever forget it even if I were to live many years. The entrance seemed to be by a long narrow pass, like a furnace, very low, dark, and close. The ground seemed to be saturated with water, mere mud, exceedingly foul, sending forth pestilential odours, and covered with loathsome vermin. At the end was a hollow place in the wall, like a closet, and in that I saw myself confined. All this was even pleasant to behold in comparison with what I felt there. There is no exaggeration in what I am saying. But as to what I then felt, I do not know where to begin, if I were to describe it; it is utterly inexplicable. I felt a fire in my soul. I cannot see how it is possible to describe it. My bodily sufferings were unendurable. I have undergone most painful sufferings in this life, and, as the physicians say, the greatest that can be borne, such as the contraction of my sinews when I was paralysed, without speaking of others of different kinds, yea, even those of which I have also spoken, inflicted on me by Satan; yet all these were as nothing in comparison with what I felt then, especially when I saw that there would be no intermission, nor any end to them. These sufferings were nothing in comparison with the anguish of my soul, a sense of oppression, of stifling, and of pain so keen, accompanied by so hopeless and cruel an infliction, that I know not how to speak of it. If I said that the soul is continually being torn from the body, it would be nothing, for that implies the destruction of life by the hands of another but here it is the soul itself that is tearing itself in pieces. I cannot describe that inward fire or that despair, surpassing all torments and all pain. I did not see who it was that tormented me, but I felt myself on fire, and torn to pieces, as it seemed to me; and, I repeat it, this inward fire and despair are the greatest torments of all. Our Lord was pleased that I should have at times a vision of this kind: I saw an angel close by me, on my left side, in bodily form. This I am not accustomed to see, unless very rarely. Though I have visions of angels frequently, yet I see them only by an intellectual vision, such as I have spoken of before. It was our Lord’s will that in this vision I should see the angel in this wise. He was not large, but small of stature, and most beautiful–his face burning, as if he were one of the highest angels, who seem to be all of fire: they must be those whom we call cherubim. Their names they never tell me; but I see very well that there is in heaven so great a difference between one angel and another, and between these and the others, that I cannot explain it. I saw in his hand a long spear of gold, and at the iron’s point there seemed to be a little fire. 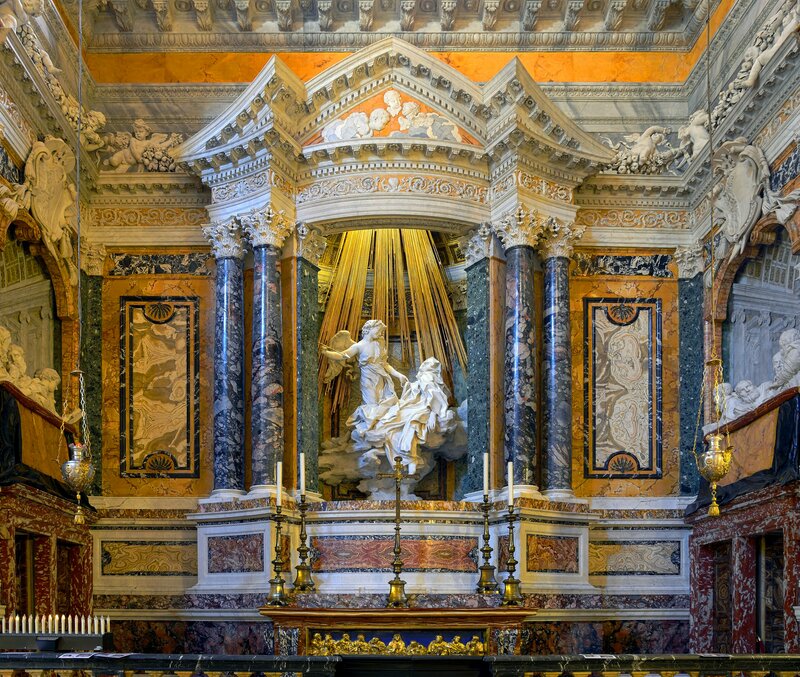 He appeared to me to be thrusting it at times into my heart, and to pierce my very entrails; when he drew it out, he seemed to draw them out also, and to leave me all on fire with a great love of God. The pain was so great, that it made me moan; and yet so surpassing was the sweetness of this excessive pain, that I could not wish to be rid of it. The soul is satisfied now with nothing less than God. The pain is not bodily, but spiritual; though the body has its share in it, even a large one. It is a caressing of love so sweet which now takes place between the soul and God, that I pray God of His goodness to make him experience it who may think that I am lying. During the days that this lasted, I went about as if beside myself. I wished to see, or speak with, no one, but only to cherish my pain, which was to me a greater bliss than all created things could give me. And yet at other times, she sensed that she perceived Jesus himself. I could do nothing but put myself in the hands of God: He knew what was expedient for me; let Him do with me according to His will in all things. I saw that by this way I was directed heavenwards, and that formerly I was going down to hell. I could not force myself to desire a change, nor believe that I was under the influence of Satan. Though I was doing all I could to believe the one and to desire the other, it was not in my power to do so. I offered up all my actions, if there should be any good in them, for this end; I had recourse to the Saints for whom I had a devotion, that they might deliver me from the evil one; I made novenas; I commended myself to St. Hilarion, to the Angel St. Michael, to whom I had recently become devout, for this purpose; and many other Saints I importuned, that our Lord might show me the way,–I mean, that they might obtain this for me from His Majesty. At the end of two years spent in prayer by myself and others for this end, namely, that our Lord would either lead me by another way, or show the truth of this,–for now the locutions of our Lord were extremely frequent,–this happened to me. I was in prayer one day,–it was the feast of the glorious St. Peter, –when I saw Christ close by me, or, to speak more correctly, felt Him; for I saw nothing with the eyes of the body, nothing with the eyes of the soul. He seemed to me to be close beside me; and I saw, too, as I believe, that it was He who was speaking to me. As I was utterly ignorant that such a vision was possible, I was extremely afraid at first, and did nothing but weep; however, when He spoke to me but one word to reassure me, I recovered myself, and was, as usual, calm and comforted, without any fear whatever. Jesus Christ seemed to be by my side continually, and, as the vision was not imaginary, I saw no form; but I had a most distinct feeling that He was always on my right hand, a witness of all I did; and never at any time, if I was but slightly recollected, or not too much distracted, could I be ignorant of His near presence. I went at once to my confessor, in great distress, to tell him of it. He asked in what form I saw our Lord. I told him I saw no form. He then said: “How did you know that it was Christ?” I replied, that I did not know how I knew it; but I could not help knowing that He was close beside me,–that I saw Him distinctly, and felt His presence,–that the recollectedness of my soul was deeper in the prayer of quiet, and more continuous,–that the effects thereof were very different from what I had hitherto experienced,–and that it was most certain. I could only make comparisons in order to explain myself; and certainly there are no comparisons, in my opinion, by which visions of this kind can be described. Afterwards I learnt from Friar Peter of Alcantara, a holy man of great spirituality,–of whom I shall speak by and by, –and from others of great learning, that this vision was of the highest order, and one with which Satan can least interfere; and therefore there are no words whereby to explain,–at least, none for us women, who know so little: learned men can explain it better. For if I say that I see Him neither with the eyes of the body, nor with those of the soul,–because it was not an imaginary vision,–how is it that I can understand and maintain that He stands beside me, and be more certain of it than if I saw Him? If it be supposed that it is as if a person were blind, or in the dark, and therefore unable to see another who is close to him, the comparison is not exact. There is a certain likelihood about it, however, but not much, because the other senses tell him who is blind of that presence: he hears the other speak or move, or he touches him; but in these visions there is nothing like this. The darkness is not felt; only He renders Himself present to the soul by a certain knowledge of Himself which is more clear than the sun [other translations say “brighter than the sun”]. I do not mean that we now see either a sun or any brightness, only that there is a light not seen, which illumines the understanding so that the soul may have the fruition of so great a good. This vision brings with it great blessings. 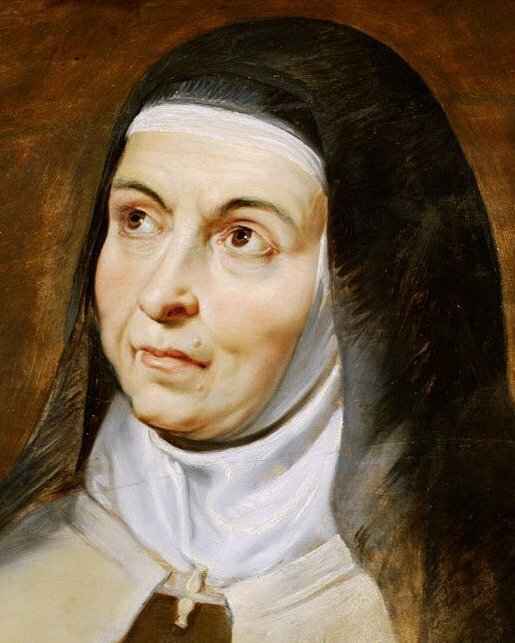 Saint Teresa of Ávila knew by direct personal experience as much of the living reality of the living God than any man who has lived in all of human history to this present moment, and far more than most men will ever come to know in their entire lifetimes. Unfortunately, such nauseating exclusive patriarchal authority and deeply ingrained misogyny and masculine dominance over women persist even today in many religions and spiritual traditions that claim they know God and assert they are acting as such under God’s direction. This is something which I strongly feel has absolutely no place whatsoever in authentic Godliness and true Spirituality. God weeps oceans of tears over such gross foolishness in the minds of humanity (mostly in male humans who think they know God). It’s a corrupt and vile perversion of God of the worst kind, and such things should be swiftly abolished to the garbage heap of history, and the sooner the better if we ever hope to actually worship the True and Living God of the Universe, and not merely the idolatrous god of depraved and immoral human history. As if I’ve said enough on that, I’ll continue on. This personage was glorious and beautiful, burning as if with flames of fire. The fire seemed to encompass themselves as well, even filling them with that fire. Next postJohn 4:21-26 BHT, What do we Worship?